Pour out the wet dough on a floured counter or table. 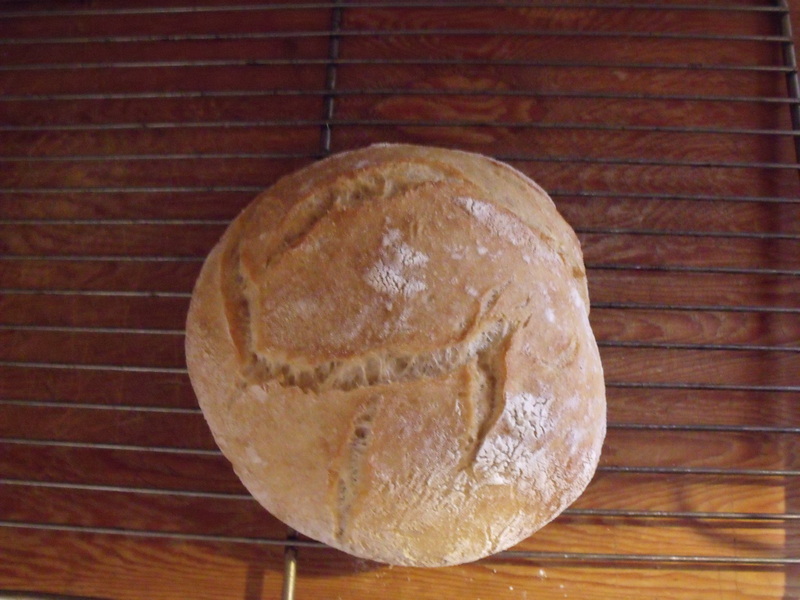 Use a dough cutter to form and cut the bread into loaves or buns. Or you can bake these into mini loaves. Let them rise for an hour or two, again flexible timing. Pre heat oven to 400 degrees and bake for approximately 1/2 hour depending on your loaf sizes. For a crispier crust, add water to the oven either by spray or by placing an oven safe container of water inside. These will not rise up like most breads. Ciabatta in Italian mean “slipper”. This makes great hoagies, sandwiches or dipping bread. If you are lucky to have a Nonna, (Italian grandmother) she will be very impressed with your baking talents. The wet consistency of the dough is what will give the bread the large holes within. For our family I always double this recipe. In the photo above you can see the variety of shapes and sizes that I have made. Often I bake smaller sized buns as well. Give it a try; it’s very easy. We can’t wait to try the recipie! Sandra – thanks for the recipe which I can’t wait to try! So enjoyed your website. Hi Sandy, this is Mary Jane ( Janey ) Citrowske GUST. and look forward to more! Glad you enjoy your visit:) Stop by in real life when you get back to our area. I missed my calling I should have been a farmer seriously.Have always played in dirt have a small yard but it keeps me happy. Now what a marvelous treat it was to see all your farm chores being done with happy hearts.All the wonderful treats you guys will share this cold winter is well worth the work you accomplished. Great! going guys I loved the pictures,bread recipes etc.To meet each day with joy,love and true acceptance is a pleasure to hear and see done on a small “Honey Farm” Yes, I agree 100% hard work makes us better people and the younger you start your children the better adults they shall be.Your higher power must be very proud of this family.I sure was, Amy G.
Just saw your story on the news tonight. What a wonderful life you have! All the beautiful Children and Grandchildren working together. My Husband and I made our very first batch of applesauce from our own apple tree we’ve have on our property, but NEVER have picked in the years we’ve lived in our home. We don’t spray the tree and usually the deer or bees get to the apples before we can..but this year we had a bumper crop and a lot of “good” apples. So we bought all the basic supplies needed to can applesauce and after 5 hours of hard work, we manage to make 15 qts of the most wonderful applesauce. It was hard work, but FUN!! Kudos to those who can! Always enjoy reading your blogs from the farm. Many bring back the memories from our farmlife growning up also. is Belle your youngest? tell her happy birthday! !